When we enter the murky basement of the Soho Theatre, the four-piece band on stage is already clattering out a bunch of colliding rock riffs and the usher is pointing at a plastic cup full of earplugs. But the raucous intro belies the fuzzy, warm-hearted musical theatre that soon follows as three short playlets by a trio of young and high-profile writers get turned into semi-sung, semi-spoken, semi-comic performances. 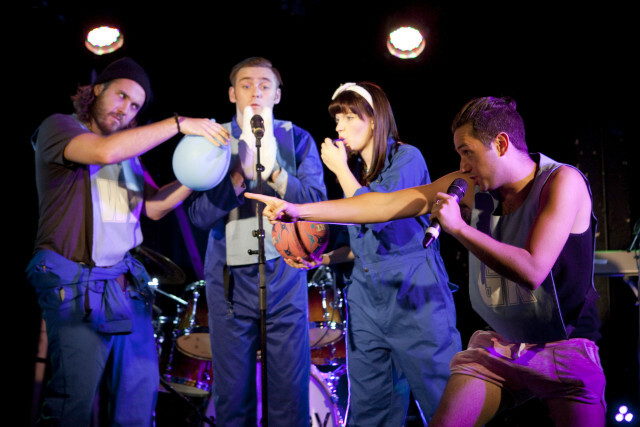 The players are impressive as they swap instruments so each one can take a turn centre-stage, pulling off their blue overalls to reveal clothes that help define altogether less confident characters. First up is Iddon Jones who strips down to a vest and a pair of perilously tight to play Jonesy, a 16-year-old asthmatic boy whose only goal in life is to pass his PE course and get that ever-elusive GCSE. It's a sweet, self-conscious story written by Tom Wells that gets funnier as Jonesy switches from football to netball in pursuit of his prize. After that comes Ella Hickson's A Love Song For The People Of London which tells the tale of a creepy man on the bus who likes to sniff the hair of the woman sitting in front of him — Liam Gerrard twirls his impressive moustache and croons with élan. The final story sees Jack Brown and Katie Elin-Salt playing two lovers who meet on the wee-covered floor of a nightclub toilet. It's the best of the three with well-sketched characters that are perfectly played and sung. Writer Nick Payne (of the hit play Constellations) deftly deconstructs the rom-com here while the precise playing of the band behind — tightly bonded after a run up in Edinburgh — works to enhance every punchlines. Symphony is a collaboration between nabokov and Soho Theatre, running there until 7 December. Tickets are £15-20. Londonist saw this play on a complimentary ticket.